Two people travel best and learn the most. Three people means exclusion: one is in the back seat sometime, left aside in a conversation. Finding rooms is more difficult where there are three. Taking tours focuses on what the guide says, rather than what you see, hear, think, feel as you go. So we go as two on the loose. Croatia, Dalmatian Coast. Primosten rest stop. Aah. 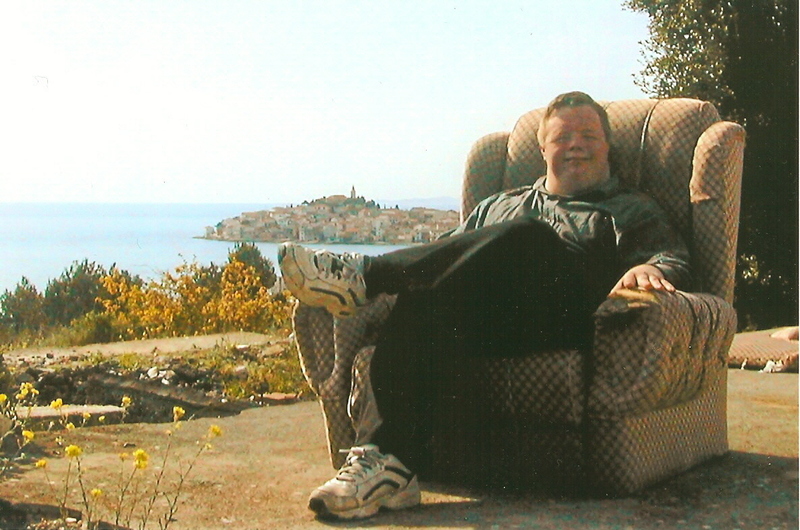 My son and travel-plotter, Daniel, happens to have Down Syndrome. He is a fine, independent and employed adult who has become more confident, educated and literate, since leaving school programs — and our travel this way. If only each young person could spend even five days abroad somewhere. We could recommend a number of densely interesting destinations. Originally, the cost of our two-week car trips was minimal: plane, rental car, cheap rooms. With costs up, we cannot go each year any more, but the investment is worth it when we do. Enjoy. For our travel hub, see europeroadways.com. In a fit of silliness, we named ourselves The Car-Dan Tour Company: not a real company, but fun for us to name ourselves ersatz. Primosten, Croatia. Drive along and find a sudden armchair on a rock ledge. Have a seat. Dan did.